WWF Super Stars 1991 By: LJN Ltd. Play WWF Super Stars Now! Do you have what it takes to be WORLD CHAMPION? Find out now. In this Action/Wrestling game, fight as one of five wrestlers: Macho Man Randy Savage, Hulk Hogan, The Ultimate Warrior, The Million Dollar Man Ted Dibiase, and Mr. Perfect. This is a very good wrestling game for its time. 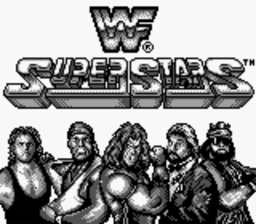 In WWF Super Stars you can perform each wrestler's finishing moves, like Hulk Hogan's ATOMIC LEG DROP or Ted Dibiase's Pile Driver. There is no color, so don't expect it, but the sound is surprisingly good. In my Opinion these graphics are clearer than in WWF SUPERSTARS 2. If you are a fan of WWF (now WWE) you will like this game. The object of the game is to beat your opponent to a pulp and pin them for the win. To perform a pin press A + B + Down. However, first you must lower his stamina meter to zero. The stamina meter is located next to the head in the top corners of the screen. During gameplay to ENTER/EXIT the ring, double-tap the directional button closest the ring ropes. To perform a powerful grapple when close to your opponent press B + any directional button.